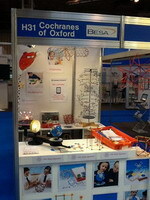 We had great fun at the Education Show this year. Thanks to everyone who stopped to see our square bubbles, red nose day kites, the new Orbit Mathematics class set plus our range of molecular modelling kits and the ever-popular Tellurium. We sold out of Construct-o-Straws and Kubic Bubbles so please remember you can order both of these plus our fabulous new Math's set and all our astronomy, physics and chemistry teaching products here on our website.